On the West Cornwall Railway a type of viaduct similar to that described above was adopted; but as the general height was not so great, the spans were 50 feet each, and the longitudinal beams were supported at thee points in each span, instead of at four as on the Cornwall Railway. In consequence of the nature of the foundations, the piers of the nine viaducts on this line where for the most part formed of upright timbers well braced together, standing upon masonry footings. The viaduct at Angarrack, 98 feet high, with 16 spans, which was constructed in 1851, was remarkable for its light appearance, owing to the small number of timbers in the superstructure and piers. Mr. Brunel paid great attention to the preservation of the material of the timber bridges and viaducts. 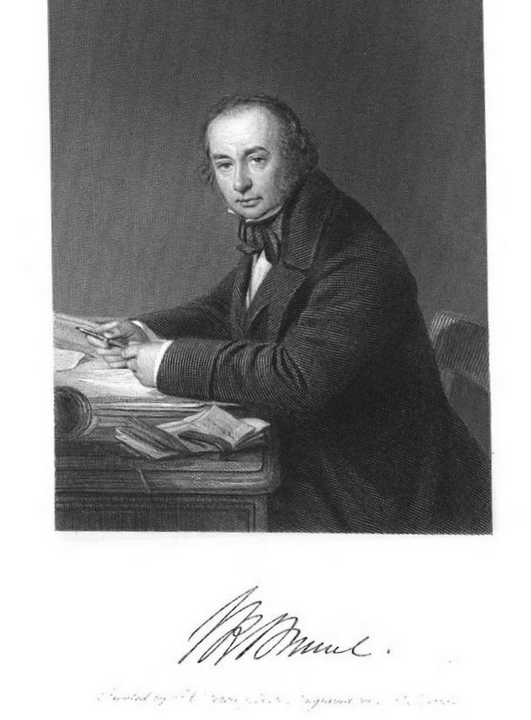 As early as 1835 he had been in communication with Mr. Faraday as to the best method of testing the extent to which the Kyanising solution penetrated into wood. Mr. Brunel made a careful trial of all the different methods of preserving timber, and employed the more successful of them on a very considerable scale. He was so impressed with the importance of the preserving processes being properly applied, that he on several occasions preferred to the keep the operation of preserving the timber in the hands of the Company, in order that it might be done thoroughly, and under his own supervision. He also minutely attended to the details by which timber structures may be protected from decaying influences. Commonly, the single track viaducts supported the rails by transverse 12 in. by 6 in. timbers placed side by side, in turn supported by three longitudinal laminated timbers, often of twin 12 in, by 12 in, sections, one central and one each under the parapets. These three longitudinal timbers were then supported in different ways according to the depth of the valley to be crossed. The aim was to support the longitudinal laminated timbers at about 16-20 ft centres, so for viaducts up to about 50 ft high it was sufficient to place masonry foundations at 40 ft centres and from these to erect two raking sets of three legs giving a V-form in elevation. When three sets of raking legs were used, as on the Angarrack Viaduct, the span could be increased to 50 ft. The raking leg, which now sprang from a level 41 ft below the deck were supported on vertical timber legs which rested on masonry foundations. For stability a continuous longitudinal timber member was placed at the level of the tops of the vertical legs at the spring point of the raking legs and iron diagonal braces were placed between some of the vertical legs. 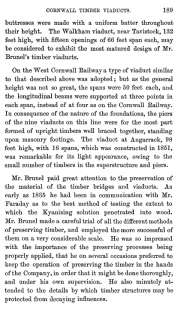 Brunel’s culminating achievement as a timber engineer was the 43 viaducts he designed for the Cornwall Railway and the West Cornwall Railway between 1850 and 1859. His work in Cornwall is one of the most effective answers to the accusation that he was careless with shareholders’ money. It was a poor county, but its beautiful, undulating landscape was challenging for a railway engineer. The timber viaducts were part of a careful y thought-out strategy to build the railways as cheaply as possible, get them running, and upgrade the lines as and when money was available. The West Cornwall Railway, from Truro to Penzance, came first: it had a head start in that it incorporated the Hayle Railway, a standard-gauge line from Redruth to Hayle built for minerals traffic which represented about a third of the route. The corn any were very short of money, so Brunel completed the line as a single track of standard-gauge line, which could be converted to the mixed gauge later. The total cost, including nine timber viaducts, was £105,000, and it opened in August 1852. The Cornwall Railway, from Truro to Plymouth, was a much more complicated proposition. Brunel had become their engineer, displacing Captain W. E. Moorsom, in 1845, and his design secured parliamentary approval the same year. Work began in 1847, but stopped again when the money ran out. 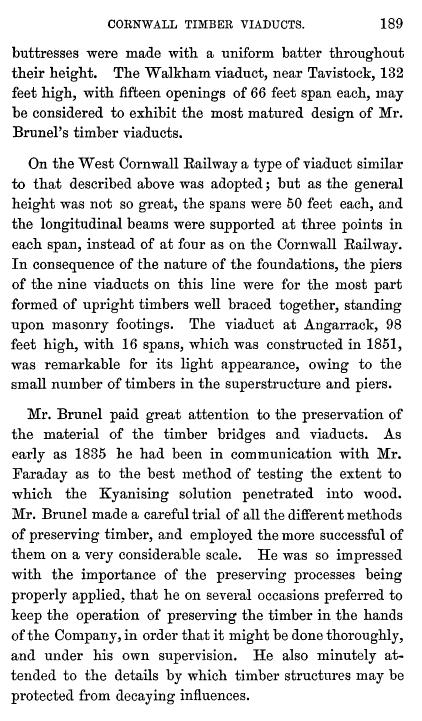 In 1851 Brunel told the board that if they laid a single line of broad-gauge rails to start with, he could finish it for £800,000, including the Saltash Bridge over the Tamar. The 53 miles of line included 34 timber viaducts with an aggregate length of over five miles, which gives some idea of just how difficult the terrain was. His designs for the viaducts went through several generations, from simple trestles supporting laminated timber beams as at Penponds, to trestles carrying trussed beams as at the 1,134 foot-long Nottar Viaduct, to trestles with timber ‘fans’ supporting the deck, as at Angarrack. For the deeper valleys, trestles would not do, and Brunel designed a series of spectacular viaducts carried on tall masonry piers: the biggest of these, at Moorswater, was 954 feet long with a maximum height of 147 feet. The highest, at St Pinnock, had a maximum height of 151 feet. All the viaducts were marvels of economical design, but the tall viaducts in particular, with their slender buttressed piers, their framing made from [long baulks of kyanised pine, set in cast-iron shoes and tied together with wrought-iron rods, were spectacular as well. While the directors were grateful (and they certainly should have been), the passengers were often terrified: the trains had to slow down to cross the viaducts, and the creaking and flexing of the slender structures must have been audible and alarming. Brunel knew, and warned the company, that they would cost a lot to maintain, but this was all part of the bargain. Gradually they were replaced, but the last of them, at Collegewood, remained in service until 1934.